A.J. Burnett battled in his 2011 season debut, and not just against the Tigers’ lineup. The right hander also had to overcome the discomfort of a nasty head cold as well as the ghosts of a disastrous 2010 campaign. In the past, scrutiny compounded by distraction has often been a recipe for failure, but this time Burnett pitched well enough to win, and that’s exactly what the Yankees did. AJ Burnett got 2011 off on the right foot with five solid innings against the Tigers (Photo: Getty Images). Over the first four innings, Burnett was the good AJ. The only blip in those frames was a 3-2 fastball thrown to Austin Jackson that was subsequently deposited into the left field seats. Otherwise, the right hander used an explosive fastball and sharp breaking curve to keep the Tigers off balance in the early part of the game. While Burnett sailed through the Tigers’ lineup, the Yankees jumping all over Brad Penny for six runs in the first two innings. The highlight of the early barrage was another three run homerun by Mark Teixeira, who has historically struggled in the early part of the season. After only two games, Teixeira now has two long balls and six RBIs. In 2010, the Yankees’ first baseman had two homeruns and nine RBIs in the entire month of April. Teixeira has made it his mission to avoid another slow start, and so far the early returns are encouraging. If Joe Girardi was pleased by Burnett’s first four innings, he had to be thrilled by the fifth. That inning started rather ominously when the first three batters singled on successive fastballs. Last year, the Tigers’ uprising would have frustrated Burnett, and the inning would have quickly spiraled out of control. Girardi’s decision to immediately start the bullpen acknowledged this tendency, but he never had to use it. Instead, Burnett retired three of the next four batters and limited the damage to only two runs. Ironically, during an inning in which he surrendered four of his six base runners, Burnett offered the first positive sign that 2011 might be much better than last year. In the bottom of the fifth, the Yankees rebuilt their six run lead when Russell Martin continued his impressive debut with a titanic three-run blast that almost landed in the left field bleachers. The inflated margin allowed Girardi to lift Burnett after only 87 pitches, leaving him in line for a win. That outcome looked even more inevitable when Alex Rodriguez belted his 614th career homerun in sixth, but some late inning bullpen struggles allowed the Tigers to come within one batter of bringing the tying run to the plate. Unfortunately for the Yankees, that meant Girardi was forced to summon Mariano Rivera. Unfortunately for the Tigers, it meant the same. Three pitches later, the game was over and Rivera was one save closer to 600. With two singles, Derek Jeter passed Al Simmons for sole possession of 35th on the all-time hit list with 2,928. Alex Rodriguez’ two RBIs brought his career total to 1,833 and tied David Winfield for 16th on the all-time list. 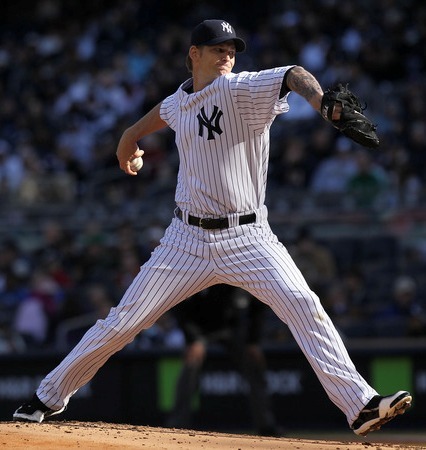 AJ Burnett is now 6-0 in April during his Yankee career.